analyzing various devices, Benzer discovered tin-doped germanium crystals that conducted current in one direction while resisting reverse flow without burning out. He received six patents for devices based on those diodes. Though he didn’t realize it at the time, Benzer came tantalizingly close to shaping those germanium crystals into the first transistors. He had tried and failed to fabricate a crystal amplifier, which would control current flow at the interface of metal and semiconductor layers. Just after Benzer received his PhD in 1947, William Shockley, John Bardeen, and Walter Brattain at Bell Labs came up with a simpler solution for amplifying current, an advance that would lead to the world’s first transistor and the 1956 Nobel Prize in Physics. “It escaped me, and it was under my nose,” Benzer said in a 1990 interview. Benzer wasn’t too disappointed by his near miss. By the time Bell Labs unveiled its game-changing technology, he had moved on to a new passion: molecular biology. He had read Erwin Schrödinger’s book What Is Life?, the same tome that inspired physics-minded scientists such as Max Delbrück and Francis Crick to pursue genetics. 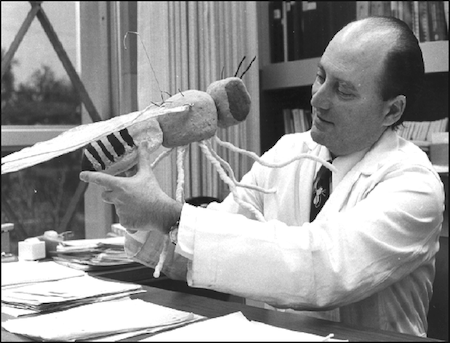 Having moved to Caltech in 1967, Benzer began exploring the effect of single-gene mutations on the behavior of Drosophila fruit flies. His clever experiments revealed how altering genes could affect the flies’ learning, vision, and sexual preferences. And in the 1970s Benzer and graduate student Ronald Konopka identified a gene they named period that was central to circadian rhythm. Mutations would cause the flies’ normal 24-hour cycles to get longer or shorter or to disappear altogether. Their studies served as the basis for Hall, Rosbash, and Young’s prize-worthy work. Hall was a student of Benzer’s before moving to Brandeis University. For all the progress he made in genetics, Benzer never lost the mindset of a physical scientist. To determine how genes affected fruit flies’ vision, Benzer built an apparatus made of conjoined pairs of test tubes. The Drosophila would run toward one tube or the other depending on its attraction to the light from a lamp. By isolating the flies that moved toward the light and repeating the experiment, Benzer ensured that he got a powerful statistical measure of the population’s photosensitivity. He got the idea from countercurrent distribution, a decades-old chemistry technique to separate liquids from each other. “He treated the flies like molecules in a chemistry or physics experiment,” Harris says.